SUMMARY: Ruby was ten when she arrived at Thurmond, a "rehabilitation camp" for children who had survived the virus that killed most of America's children. Ruby knew then that she had special abilities that made her dangerous, but unlike many survivors like her, she successfully outsmarted the tests. For six years, Ruby hid her abilities from those who would kill her if they knew. Now at age 16, Ruby's carefully-guarded secret has been discovered, and she has no choice but to run. REVIEW: Easily among 2012's best! 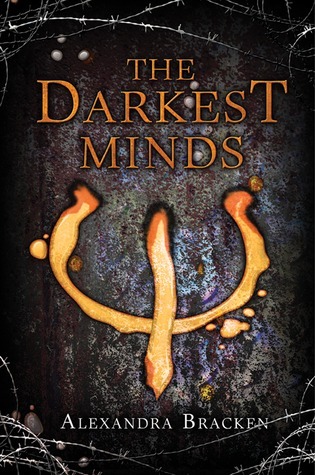 I read The Darkest Minds obsessively, reading almost all of its 496 pages in two sittings. Interesting characters and non-stop (heart-pounding!) action kept me turning pages as fast as possible. As a comparatively slow reader, I got annoyed with my reading speed at times; I just couldn't devour the words fast enough to keep up with the action! Epic. Not since Shusterman's Unwind and Ness's The Knife of Never-Letting Go have I read such intense action. Parts of TDM even reminded me of Unwind--teens on the run, hunted by a government gone wild. As in Unwind, terrorist organizations work for change, but these organizations are also corrupt, power-hungry, and extremely violent. I love how the characters don't always know who to trust and sometimes have no choice but to trust the wrong people. The teens-with-superpowers plot line reminds me of Grant's Gone series. Yes, I am comparing TDM with another of my favorite series! As in Gone, the teens in TDM have dangerous superpowers that they are still learning to control. I love the classifications of powers into color categories, and since we never meet any reds in TDM, I am dying to read the sequel to find out exactly what the reds are capable of. I also am interested to see if powers grow or change over time. The virus has not been eradicated, and survivors are still exposed to it. Though I compare TDM with several similar reads, TDM stands on its own among these giants of current YA fiction. The characters and premise are unique. I've read all of the readalikes I compare this to (see readalikes below), and I do not believe TDM is too similar or recycles familiar plot lines. Though some story threads are similar, TDM is beautifully written and unique with a greatness all its own. The romance is beautiful and sweet and sad and really works for the story. As much as I love Liam, I don't think he will be Ruby's only love interest in this series. And the ending! All I can say is WOW. The last 50 pages were one of those times my mind could not consume the words fast enough. Gut-wrenching and just...sigh. I won't be surprised when the movie rights are sold. Bring on the sequel!!! THE BOTTOM LINE: One of the year's best. Read it. Now. STATUS IN MY LIBRARY: Despite language, sexual content, and violence, I am getting The Darkest Minds for my middle school library. I know demand will be high enough to warrant the purchase of multiple copies. My school has a huge market of potential readers for this book, and I don't think the content is any worse than any of the readalikes listed below (all of which have been HUGE hits with my students). Librarians unsure about purchasing The Darkest Minds should look at the readalike list below. If you have some or all of these books, TDM will fit in just fine in your library. Language: medium; pretty mild until one curse-laden tirade near the end. It only lasts a few paragraphs and is totally appropriate for the scene and character, but it holds nothing back. Includes 3-4 F-bombs and sh**.